Last night I sat in on Community Board Three‘s Landmarks Committee meeting. If you walk through Bed Stuy and think, “Hey, this is a gorgeous neighborhood, I wonder how it still looks this nice/historic,” well, the answer is these guys. They have been working hard to landmark the area for years, and are still working to expand the landmarked districts. (Little known fact I learned at the meeting last night: only 4 percent of New York City is landmarked.) There are still four districts that the board is fighting to landmark, with one district — the Bedford Historic District — already under consideration by the Landmarks Preservation Commission. 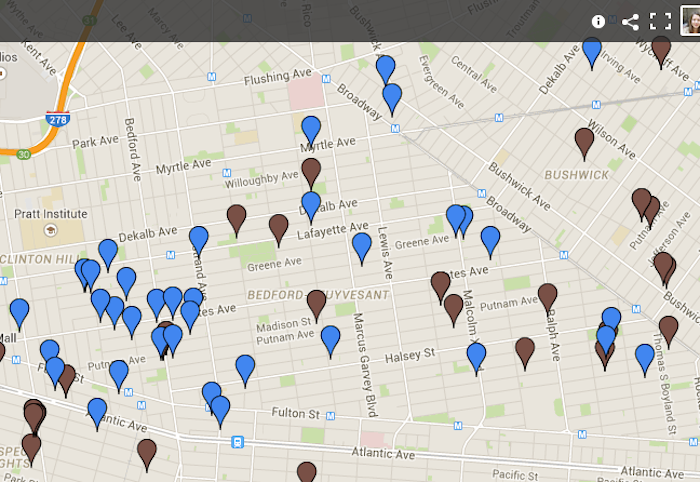 Brookland in Bed Stuy, mapped. Last night, a developer and architect behind Brookland Capital came to speak with the committee. Brookland specializes in small to midsize developments and currently has 149 units over 10 projects in the works in the neighborhood. They don’t typically work within landmark districts in Bed Stuy and their projects sometimes end up, well, ugly. (A few Brookland developments put on the hot seat were 447 Decatur and 664 Jefferson, both under construction.) The committee asked for more contextual design — “No glass and steel buildings, please” one board member asked. Brookland was quite receptive and said they’d be willing to accommodate the community in their process. They invited anyone to stop by their office on Malcom X to talk, and I’d love it if people started showing just to keep these guys accountable to better new design. 100 Ralph Avenue, a Habitat project that has fully sold. Two ladies from Habitat for Humanity spoke, reporting that Habitat is currently selling 105 apartment units over 24 buildings in the neighborhood. Habitat plans to have an even larger presence in the area, with larger developments. The organization provides affordable housing, which is always welcome news to the majority of New Yorkers including myself. There was lots of discussion on pushing more landmark designations through for the neighborhood. If you’re not familiar with the LPC process, this is hard work that requires a lot of support from not just the community board but also the community in general, as well as local pols and oftentimes the media. There was talk on rallying support from various politicians, and the best ways to approach landmarks. 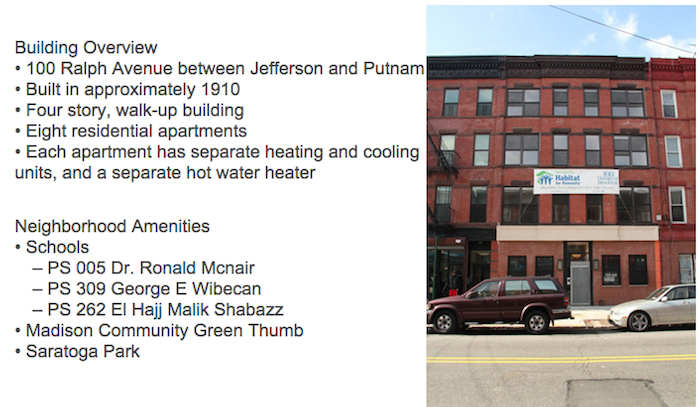 If you’re interested in following this process, you should check out the Save Bedford Stuyvesant website.